Before introducing solid waste management, let's start with a discussion of the material being managed — solid waste. Solid waste refers to the range of garbage arising from animal and human activities that are discarded as unwanted and useless. Solid waste is generated from industrial, residential and commercial activities in a given area, and may be handled in a variety of ways. As such, landfills are typically classified as sanitary, municipal, construction and demolition or industrial waste sites. Waste can be categorized based on material, such as plastic, paper, glass, metal, and organic waste. Categorization may also be based on hazard potential, including radioactive, flammable, infectious, toxic, or non-toxic. Categories may also pertain to the origin of waste, such as industrial, domestic, commercial, institutional or construction and demolition. Regardless of the origin, content or hazard potential, solid waste must be managed systematically to ensure environmental best practices. As solid waste management is a critical aspect of environmental hygiene, it needs to be incorporated into environmental planning. On a per capita basis, North American region generates the highest average amount of waste, at 2.1 kilograms per day; total waste generated was 289 million tonnes annually in 2016. Waste collection coverage in North America is nearly universal, at 99.7 percent, with the gap in collection coverage occurring in Bermuda. More than 55 percent of waste is composed of recyclables including paper, cardboard, plastic, metal, and glass. At 54 percent, more than half of waste in North America is disposed of at sanitary landfills and one-third of waste is recycled. (Source: World Bank). What Is Solid Waste Management? In its scope, solid waste management includes planning, administrative, financial, engineering and legal functions. Solutions might include complex inter-disciplinary relations among fields such as public health, city and regional planning, political science, geography, sociology, economics, communication and conservation, demography, engineering and material sciences. Solid waste management practices can differ for residential and industrial producers, for urban and rural areas, and for developed and developing nations. The administration of non-hazardous waste in metropolitan areas is the job of local government authorities. On the other hand, the management of hazardous waste materials is typically the job of the generator, subject to local, national and even international authorities. The primary goal of solid waste management is reducing and eliminating adverse impacts of waste materials on human health and environment to support economic development and superior quality of life. Waste generation refers to activities involved in identifying materials which are no longer usable and are either gathered for systematic disposal or thrown away. Onsite handling, storage, and processing are the activities at the point of waste generation which facilitate easier collection. For example, waste bins are placed at the sites which generate sufficient waste. Waste collection, a crucial phase of waste management, includes activities such as placing waste collection bins, collecting waste from those bins and accumulating trash in the location where the collection vehicles are emptied. Although the collection phase involves transportation, this is typically not the main stage of waste transportation. Waste transfer and transport are the activities involved in moving waste from the local waste collection locations to the regional waste disposal site in large waste transport vehicles. 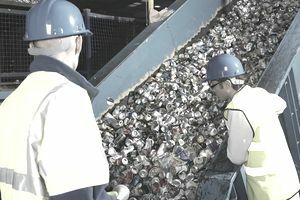 Waste processing and recovery refer to the facilities, equipment, and techniques employed both to recover reusable or recyclable materials from the waste stream and to improve the effectiveness of other functional elements of waste management. Disposal is the final stage of waste management. It involves the activities aimed at the systematic disposal of waste materials in locations such as landfills or waste-to-energy facilities. As the field of solid waste management advances, solutions are being looked at in a more systematic and holistic way. ISWM, for example, is an increasingly important term in the field of waste management. It refers to the selection and use of appropriate management programs, technologies, and techniques to achieve particular waste management goals and objectives. The U.S. Environmental Protection Agency (EPA) states that ISWA is composed of waste source reduction, recycling, waste combustion, and landfills. These activities can be done in either interactive or hierarchical way. On a closing note, it is important to stress that better solid waste management programs are urgently needed in some countries. Only about half of the waste generated in cities and one-quarter of that produced in rural areas is collected. Internationally, the World Bank warns that global waste could increase by 70% by 2050 under a business-as-usual scenario.